The Saturday after Thanksgiving, Grandma Lydia came back from her trip to New York and she and Grandpa Tom took us to the zoo! We knew Charlie would love it because he loves being out and about and dogs. I guess we figured that if he loves dogs he must love all the other animals at the zoo. Kind of true. 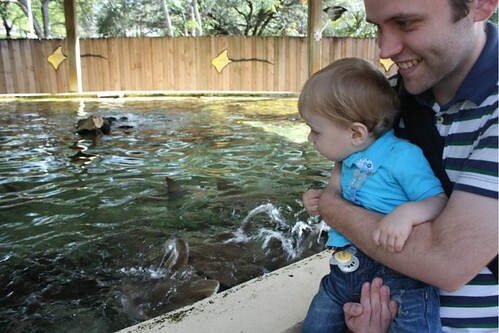 He was very interested in the sting rays. They came over to wave at him. Other people were feeding them, but we didn’t have any food. Sorry stingrays. 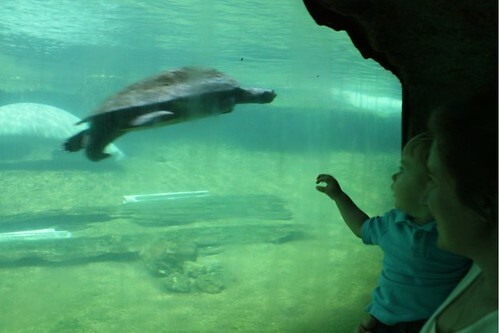 The turtles and manatees were also a big hit. That’s how Charlie points, with his whole hand. He’s very polite. It’s very Disney-like. 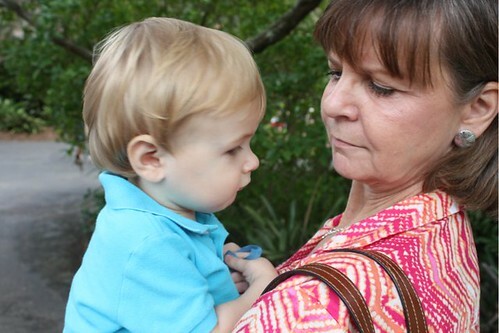 Telling Grandma about all the animals he’s seen. 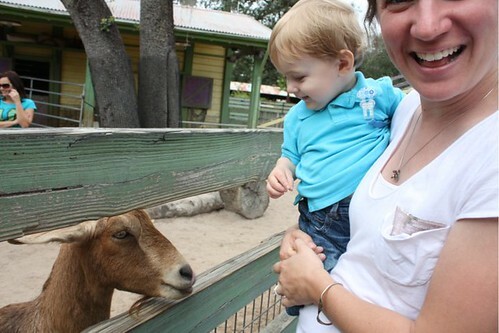 Later, we went to the petting zoo part. At first, he was really excited about this idea. We didn’t actually go “in” because it was really dirty in there and I was wearing flip flops. 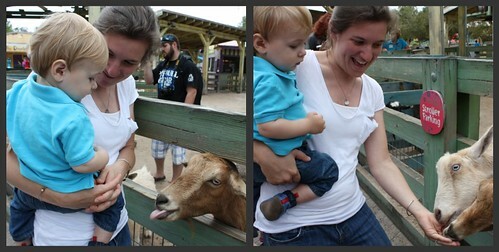 And there was goat poop. But then we got food and lots of goats came. Hungry goats. Look at that tongue. This quickly escalated to a scary, NOT fun situation for poor Charlie. As soon as one of the goats jumped up when I ran out of food, quivering lip, screams, cries, terror! Time to say bye to the goats. The thing I was most excited to see was the giraffes because I knew we could get really close to them. They ended up being the last thing we got to. This wasn’t the greatest idea because the only time Charlie’s eyes closed was while they were blinking. So, of course this happens right as we get to the giraffes. Nice, Charlie. Whatever, that didn’t stop us. 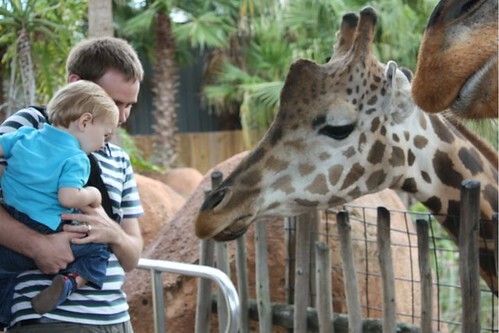 He needed to see the giraffes! 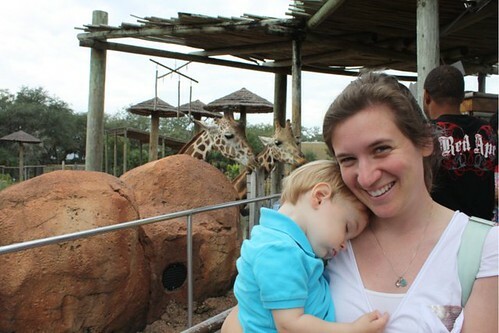 So we risked having him wake up face to face with a giraffe. 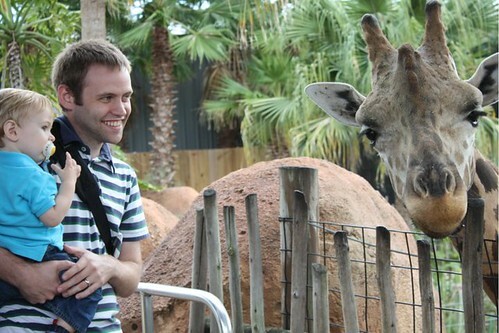 This giraffe really wanted us to give him a giraffe cracker, but we didn’t have any. Sorry giraffe! Such a great day at the zoo! I can’t wait to take him again when he’s a little older and it’s warmer outside so he can play at the splash pad. Thanks grandma and grandpa!